Mortgage applications increased 3.1 percent from one week earlier for the week ending March 10, 2017. The refinance share of mortgage activity increased to 45.6 percent of total applications from 45.4 percent the previous week. The average contract interest rate for 30-year fixed-rate mortgages with conforming loan balances increased to its highest level since April 2014, 4.46 percent, from 4.36 percent. Home loans for purchases increased to 57 percent in February, up from 53 percent in January. 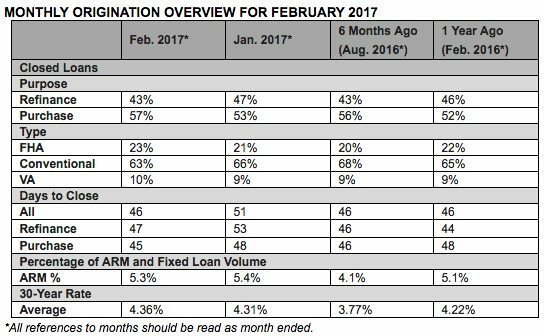 The average time to close all loans decreased to 46 days in February, down from 51 days in January. Average FICO scores dropped with the average FICO score on all closed loans at 720. 2.6 percent of all mortgages were in serious delinquency (90+ days past due and in foreclosure) in December 2016. This represents about 1 million homes. 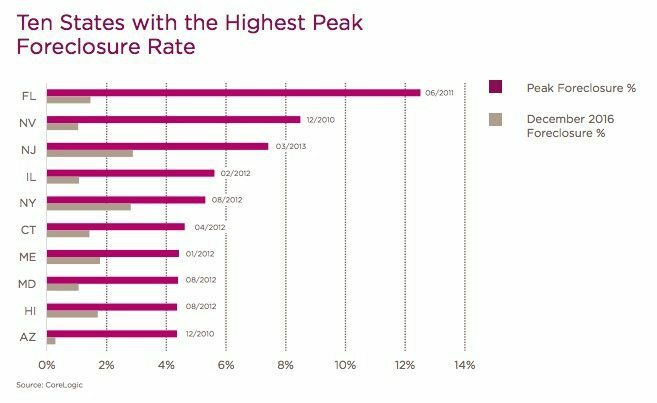 The peak serious delinquency involved 3.7 million homes in 2010. Mortgage applications for new home purchases increased 2.2 percent compared to February 2016. 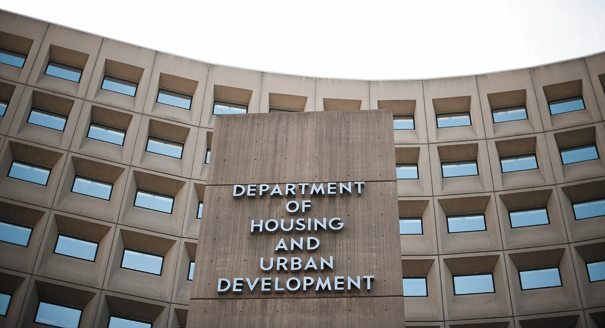 Compared to January 2017, applications increased by 16 percent relative to the previous month. Confidence for transaction volume growth over the next 12 months increased 0.4 percent from Q4 2016 and increased 0.63 percent compared with a year ago. Confidence for growth in purchase transaction volume over the next 12 months increased 6.5 percent from last quarter and 3.7 percent compared with a year ago. Prices across all property types are expected to grow by 2.5 percent over the next 12 months, which is up from last quarter’s expectation of a 1.7 percent increase. 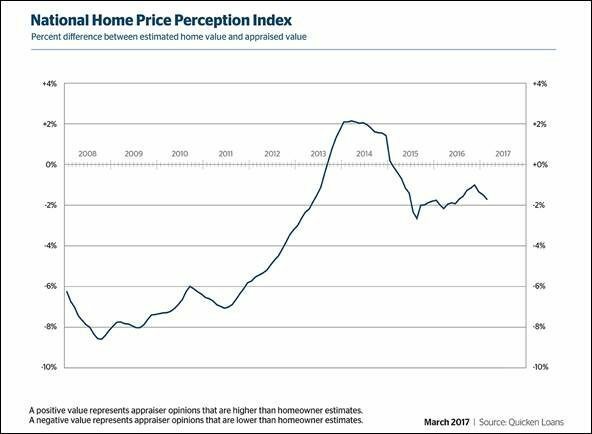 According to the HPPI, appraised values were 1.69 percent less than what homeowners estimated in February. In January, appraiser opinions were 1.47 percent lower than homeowner expectations. Home values rose 0.55 percent from January to February, according to the National HVI, and increased 2.95 percent compared to the previous February. 61 percent of current homeowners are satisfied with the state of the U.S. economy today, a 13 percent increase from the last wave of the survey (fielded shortly before the December interest rate announcement). 84 percent of current homeowners and 81 percent of prospective homeowners agree that increasing interest rates are a challenge facing the real estate market today, a 7 percent and 3 percent increase from the last wave of the survey, respectively. If mortgage rates were to go up, 39 percent of current homeowners and 65 percent of prospective homeowners say they are more likely to feel anxious, rather than indifferent about such a hike.